Le port de tête: the way you hold your head. Picture source: http://www.mesacosan.com/conseil-en-image-femme/comment-etre-elegante-avec-un-joli-port-de-tete-a2183.html. When you find a great bookstore, there’s always that question: do you keep it to yourself so that no one else gets the really good books, or do you tell the entire world about it so that the bookstore stays in business? The long-term solution is clear: you have to tell people about it. In that spirit, I’ll tell you how to find great Francophone used bookstores in Montreal. All you have to do is go to rue Mont-Royal Est in the Plateau neighborhood and wander up and down the street. Even on a Sunday afternoon, I found a number of used bookstores open–more accurately, bookstores with a mix of used and new books, for the most part–and they were all great. If you want a place to sit and read your purchases, I recommend the Kahwa Café (more on that below). If you want to find addresses for specific bookstores in the Plateau, as well as other Francophone used bookstores in Montreal, grouped by neighborhood, try this link. Le port: port, harbor, shelter; bearing, wearing (e.g. le port de lunettes, “wearing glasses”); bearing, way of holding, way of carrying. That final sense is the one that we see in le port de tête. le rhinocéros: rhinoceros. In the Le port de tête bookstore, I asked the owner if she could recommend a cafe. She told me about the Kawha Café, and told me that it was on the other side of the street, down the block, and had two [unintelligibles] sticking out of the wall, making this odd gesture of showing things sticking out of her forehead. Turned out that the unintelligible words were “rhinoceros heads.” Hard to catch, out of context, even with the helpful hand-gestures–I guess that now I know the international hand signal for “rhinoceros head,” though… Picture below. 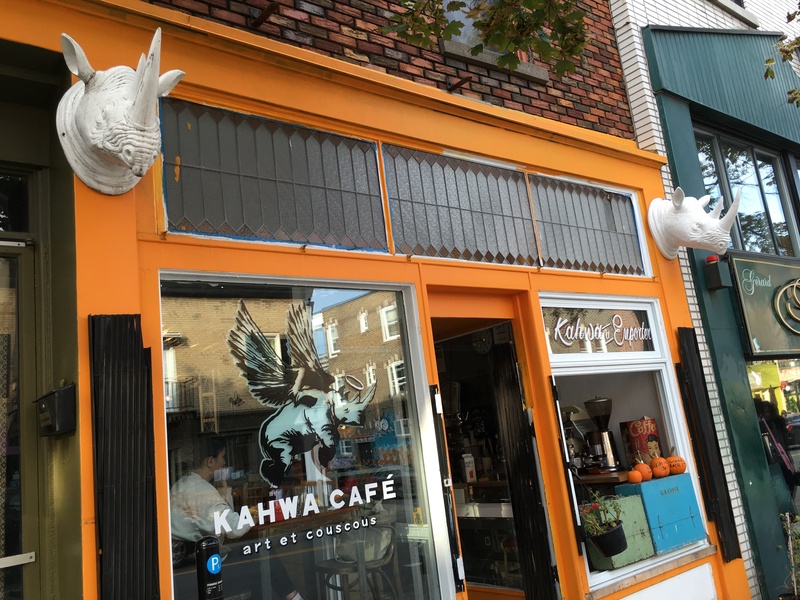 The Kahwa Café, in the Plateau district of Montreal. Picture by me.